Navigating gift giving holidays when you are trying to live more simply can be tricky. While some people want to skip the gifts all together, I believe we can be more creative in giving meaningful gifts instead of perfect gifts. Becoming a minimalist doesn’t mean you have to sacrifice holiday traditions or become the family Scrooge. In fact, now that your priorities are becoming more clear, you may be giving more than ever before. 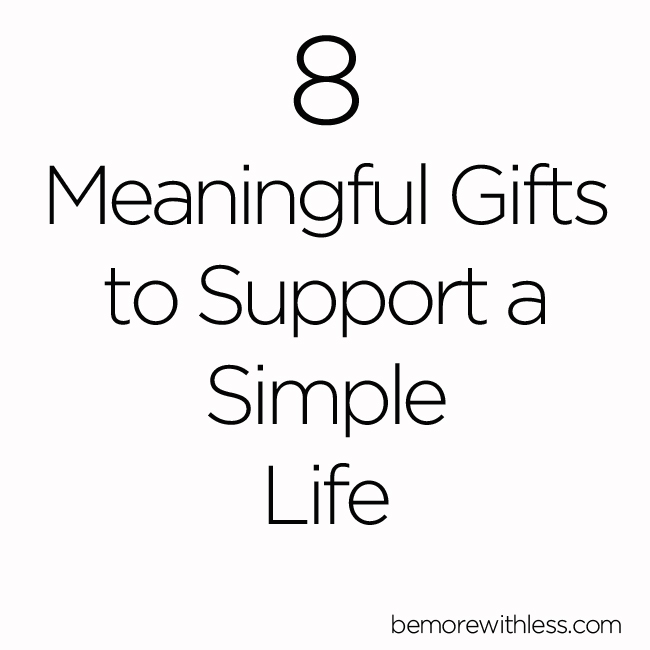 If you want to find a gift for someone who wants to live more simply, or you want to live more simply yourself, consider these 8 meaningful gifts to support a simple life. The reason I created this advent-like calendar for your inbox is because I realized that the best things aren’t usually things at all. This program is a daily reminder for you, me, and the people we love about what the holiday season really means. 2. More time with you. Bake for your family and friends. If you have a cookie dough addiction like I do, make pies, toffee, or another sweet treat to share with your loves. Make a playlist on Spotify or YouTube for the people you love. Be specific in your song choices so your recipient knows it’s just for them. If you want to cultivate a sense of adventure in the new year, check out Tammy’s Everyday Adventure Journal. Feed your homeless community. Make sandwiches, or goodie bags with snacks and deliver them to people who need them most. Reserve judgement, make eye contact, and remind someone who may have lost hope, that someone cares about them. One sandwich might not change the world, but it will make someone smile. A warm heart and full belly will mean so much. Is there a gift you can give to support someone’s dream? Consider an online course for a family member who wants to start a blog or write a book. Find a book that provides motivation for someone making a big change in their life. Letting someone know you believe in them is a meaningful gift. Make a donation to the Hope Effect in honor of someone you love. Give the things we sometimes take for granted like beds and homes to orphans who are living without. I’m offering lots of goodies for donors. Learn more here. However you decide to navigate gifts this holiday season, give and receive with an open heart. If you are worried about clutter, maintain a one in, one out rule through the holidays. If you notice you are letting the stress of gifts or other holiday-related activities get in the way of the joy and peace you seek, focus on creative ways to give more, love more, and be more with less. Still stressed? Take a walk. Courtney, I love this. In addition to eliminating stress, focusing on the simple joys of the season makes it so much more meaningful.